Micro Craft's Docket is a calendaring/ time management software system written specifically to address the needs of a law office. With Docket you can keep track of those unforgiving dates and deadlines in litigation. Docket won't allow a filing deadline to slip by or a statute of limitations to run. And you can keep track of appointments and things to do with a printout every day. All you do is enter information into the computer and Docket places it in the appropriate slot. You can call up your calendars for as many days in advance as you choose. You can also call up composite calendars for two or more partners. This makes arranging meeting and handling emergencies as easy as pressing a button. Docket provides you with the reports you need to increase productivity and better manage your time. You can get Past Due Reports of everything past due and Future Due Reports of everything due in the future. You also have daily calendars for one day or as many days into the future as you desire and calendars of critical deadlines only. In addition, Docket provides an Account Inquiry Report for any individual account, so you can see what yet needs to be done for a particular case or matter. By using Docket each day, you get clear, concise, up-to-the-minute schedules for ease in setting new appointments or arranging out-of-town trips. Docket was created in a law office to address the very special time management needs that only an attorney has. With Docket you won't miss that litigation deadline or miss a to-do item for a particular case. 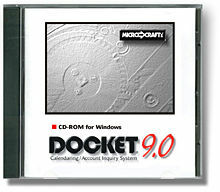 Our newest Windows version of Docket, version 9.0, has real power, never before offered. You can schedule an event with ease. View the calendars you need to see, select a time that all attendees are free, then push a button to add the event to the calendars for all attendees. Docket integrates to Verdict 9 and Verdict 10 or can be used alone, without Verdict. If you have Verdict 9 or Verdict 10, events on your calendar in Docket can be sent to Verdict as billable entries with the touch of a button, to give you a completely integrated system. If you’re updating from an earlier version of Docket, you’ll find the new Windows version has an entirely new look and feel while retaining all the features you need. And you’ll find a host of enhancements that make Docket easier than ever - almost fun! One important feature we have never lost site of is that Docket needs to produce account reports so you see exactly what has to be done for a particular case. It’s fine to see a calendar, but you also need to see matters account by account. In Docket 9, you can easily view all events for a particular account. You see what has been checked off as completed and what remains to be done.